Finally you can watch your Blabberize Full Screen (as above) upload to YouTube or Flickr, or download to your desktop & embed into a PPT.....But only till June! 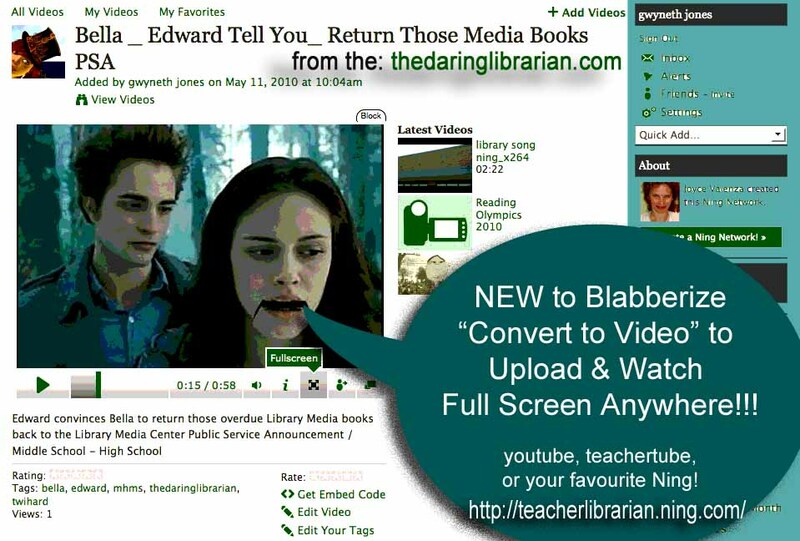 Educators have been asking when the free test of blabber-to-video conversion ends, so that they can plan their Blabberize use around the features available. Well, we’re not ready to release our membership features, but we can shoulder the cost of videos until June, which hopefully gets most of our educator users to the end of the current school year. So go make videos, and, if you get a second, let us know what you’re doing with them! Video on basic Nings may be going soon, too! ....but while i could, i uploaded this vid on the AWEsome TeacherLibrarian Ning (join it!) and also Flickr as seen above and below.